Moscow is opposing the U.S. Senate’s decision to ban all deals between the Pentagon and Rosoboronexport, Russia’s main arms exporter, says Russia’s Deputy Foreign Minister, Sergei Ryabkov. He fears that this may damage Russian-American cooperation, Ekho Moskvy radio reports. On Dec. 3, it was announced that the U.S. Senate had approved a ban on Department of Defense deals with the Russian company Rosoboronexport. The provision is included in the defense budget and will come into force after U.S. President Barack Obama signs the 2013 federal budget into law, the press service of U.S. Senator John Cornyn reported. Cornyn, a Republican senator of Texas, was the one who introduced the document. Russia considers the American move to be ill-advised. The first casualty of the ban is likely to be the multi-billion deal to buy helicopters for Afghanistan. However, Russian Deputy Foreign Minister Sergei Ryabkov said it was too soon to draw any final conclusions, since the ban has not yet come into force. “We are against a policy of sanctions or quasi-sanctions, whatever motives are advanced to bolster such policy,” said Ryabkov. The U.S. refuses to cooperate with Rosoboronexport because of Russia’s long-term cooperation with Syria and Iran. Washington has accused Bashar Assad’s regime in Syria of crimes against humanity and suspects Iran of developing nuclear weapons. “U.S. taxpayers should not be put in a position where they are indirectly subsidizing the mass murder of Syrian civilians… especially when there is an excellent alternative to procure similar arms from American dealers. By preserving business ties with Rosoboronexport, we undermine American policy in Syria and the U.S. efforts to support the Syrian people,” said U.S. Sen. Cornyn. 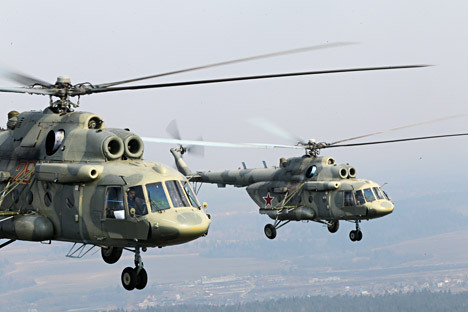 The main arms contract between the U.S. and Russia involves the supply of 33 Mi-17 helicopters for the Afghan army. U.S. representatives said earlier that they intended to carry the deal through.